NumaLink is a valuable tool for exchanging patient studies between multiple vendors of nuclear medicine computer systems or from nuclear medicine systems to PACS. Available in a number of configurations, this application supports all types of patient studies, including those acquired from normally incompatible sources. NumaLink allows nuclear medicine systems from different manufacturers to share patient data through local and wide area networks. In many configurations the destination system recognizes the translated studies and automatically start the appropriate processing application. NumaLink extends the useful life and increases effectiveness of your nuclear medicine equipment. Older systems can transfer data to access the speed and power of the newest processing applications. NumaLink enables non-DICOM or incompatible DICOM systems to communicate with systems that require vendor specific DICOM by preserving critical administrative data and eliminating unneeded files. Studies are easily available for display and analysis on the destination system. The NumaLink software is designed and customized to interface with the site’s unique nuclear medicine equipment and imaging protocols. This custom configuration feature maximizes workflow and efficiency when transferring patient studies between systems. NumaLink is ideal for healthcare enterprises, hospitals, clinics, core labs and research facilities. 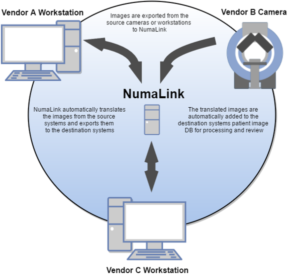 Seamless data transfers: The NumaLink often emulates unneeded systems from the workflow. Data is exported to the NumaLink and automatically transferred to the processing application. Support for raw and processed study types: NumaLink supports static, dynamic, gated, whole body, SPECT and Gated SPECT. Unnecessary files are not transferred to the destination application. Remote support: Numa’s technical support can provide service by the Internet or VPN connectivity. Custom configurations: One NumaLink system can be configured to transfer data between several manufacturers’ systems. Call for quotations on custom configurations. NumaLink creates multi-vendor nuclear medicine departments. Select the “best in class” to meet your department’s needs. NumaLink allows legacy nuclear medicine and nuclear cardiology systems to be integrated into a PACS environment. Standardize all patient studies on one processing / reporting application. Studies acquired on older but suitable gamma cameras can be processed on the latest and fastest workstations and applications for advanced reports and diagnoses. Higher reimbursement rates for preferred procedures. Increased value and useful like of for capital equipment.